Trading is probably one of the most difficult endeavors one can choose in life. The amount of knowledge to learn is overwhelming, the amount of information to read, process and understand in real time is pushing our limits as human beings. It can be really draining emotionally, exhausting physically. You do not get any reward from doing what you do other than monetary – and it can take much time before these monetary rewards are starting to come your way. There is no one to support you either when you are trading privately. There is no value that you are generating for the society, unless you do so with the money you earn on the market. Given all that, it is only normal that on many occasions you will be stuck. You will feel like quitting, depressed and frustrated. What do you do in these situations to help you move on? First let’s see why these black stripes happen in our trading career. Interestingly enough, they are not necessarily caused by big losses that one might experience. I think we are most vulnerable to such emotional drawdowns during our learning phase. It can take years of regular trading education, including practicing the concepts on a demo or a small real account before the trader starts seeing the light in the end of the tunnel. During this time there are many challenges that we must deal with. Income generation. The chances are that any starting traders will not be able to make money consistently for more than a year – and that is a very optimistic estimate, given that there is right learning information available. It is very difficult to work another job while studying and practicing the markets. The overwhelming amount of information. Depending on your goals, you might want to implement a simple trading system and do it consistently every single day, not bothering to learn much more about the markets. This approach never worked for me, and was actually preventing me from moving forward with my trading, as I was hoping to “make it” with very simple methods, refusing to learn more. Having to do the same steps every day consistently that can be difficult physically (our brain is just like a muscle, and will get tired from too much mental work). Not having a clear work process. This is a huge one. Even if you are ready to put in all the hours required, ready to show up consistently every single day to analyze the market and find the entries according to your trading system, you will be frustrated more often than not unless you have a clear Daily plan, Journaling method, Analysis and Entry rules. My own approach to all these issues changed greatly over the years, and only very recently I was able to work positively with them. Five years ago I would get excited about some new trading idea, work for a week or two like crazy on it, fail to get immediate results and proceed to become extremely frustrated, abandoning all trading for many weeks. It is obvious that such attitude was preventing me from reaching any consistent success. Two years ago I would start trading a small live account or a demo daily. I would do all the necessary analysis, put on the trades and do some notes in the journal. I would not have a systematic approach in doing it however. More often then not I would finish 2-4 weeks period with reasonable profits, but would burn out completely in the process. The result was abandoning the trading again. Just recently I started trading consistently, analyzing the market every single day, researching different trading opportunities and putting the trades on. Despite all the technical knowledge that I accumulated over the years I am still making many mistakes and moving forward only by analyzing and working through these mistakes. I record and analyze every single trade that I place, writing a journal entry when opening the trade and another one when closing it. Only by working through one mistake after another, one failed trade after another, I am building a consistent trading system. The main factor that gives me confidence moving on every single day, placing the trade, not quitting, is market psychology that I’ve been learning over the past two years. My technical understanding of the markets did not change much, but my attitude has changed dramatically. Every time I see a stop loss being hit I am completely calm and accepting. Every loss I get is just another lesson. Thanks to building a very rigid money management system I am completely comfortable with the price I am paying for these daily lessons. This is when real trading education happens – after all the theory and analyzing the markets on the history. As I mentioned many times before, it is my opinion that your expectations about the market is one of the most important aspects in defining you as a consistently profitable trader. Market is unlike any day job in that you do not have a clear certainty in your expectations, like the amount of your paycheck, possible promotions, vacations, health plan, etc. When you trade for living all these variables have to be defined by you. Alas, not all of them can be clearly defined at all. In the previous article we discussed how you can build your expectations about the amount of work you have to do, how often you have to analyze the market, for how long you are going to hold the trades, etc. Today I would like to concentrate on another very important aspect, that of your profit expectations. I think that many traders start with completely unrealistic expectations, which leads to a lot of frustration and emotional pain as they cannot get these fulfilled. When you see ads on TV with a truck driver owning his private island, implying that he bought it from the profits made in the market in his free time, it is not difficult to understand why so many traders are greatly misled. First of all, let’s take a look at how the profit is generated on the market. At first sight it seems an obvious question – the profit is generated by the trades we close and open. I would like to argue that it is not as simple as that. In my opinion it is much more beneficial to view the direct outcome of the trades as the return ratio between the risk in these trades and the reward they return in terms of price movement that was taken. In other words, if the trade returned 100 pips and we risked to be stopped out at -50, this trade generated the return ratio of 2 (100/50). I find such definition much more helpful because it emphasizes that our profit is always tied to our risk, to the potential loss we can have on that trade. I keep emphasizing that on the market the goal number #1 is survival, i.e. account preservation. We have to play good defense before we can start applying offense. With most investing even if you put all your money in just one company you are risking blowing up the whole account only if the company’s stock ends up trading completely worthless and there is no one who will take it from you even for free. When you distribute your money between 10 different companies in different sectors you chances of blowing up 100% of your original stake are getting pretty low. With options, futures or on Forex everyone is so used to huge leverage that they cannot even imagine trading without it. When you trade on Forex, you normally get anywhere from 1:50 to 1:100 leverage. The leverage basically means that you can invest 50 or 100 times more money than you own. However, when you invest 100 times more than you own, the account will be wiped out with only 1% move against you instead of 100% when you trade with no leverage. At the same time you can double your money 100 times faster when the price goes in your favor. Let’s take a look at a reasonably conservative example. Let’s say that we want to limit our potential losses to no more than 10% a month calculated from the initial capital at the start of the month. Given 20 trading days a month, we will have 0.5% risk available each day. To make sure we don’t lose all the money we already made, let’s say that we never open more than 0.5% worth of new positions on any given day. Let’s say we lose 10% a month for the whole year and we started with $10 000. What is the size of our capital by the end of the year? No, we are not in debt of $2000 because we lost 120%. Our capital is still ~$2541. Because each month we recalculated our risks, when we lost the first 10% ($1000), the next month we only had $9000*10% = $900 available to risk. Essentially, it is not possible to blow up the whole account when using even such a simple money management technique. However, let’s also consider how long it will take us to rebuild the account back to $10 000, giving the same trading rules and starting after 12 months of losses, i.e. at $2500. After 12 months stably making 10% and compounding our profits at the end of each month we will be at $7846. It will take another two and a half months before we arrived back to $10 000. Even though it took us longer to rebuild back the losses, let’s consider it in a different way. During the first year, while we were consistently losing 10% a month, we ended up with approximately 75% loss – at $2500. The next year, when we started making 10% with the same consistency and reinvesting our money back at the end of the month, we arrived to ~$7850 after 12 month – more than 200% increase over the initial $2500 we had left. In order to restore our $2500 account back in short amount of time, we used compound interest – any profits that we were making, were left in the account and we continued trading with them. The power of compound interest is well known, however in order to exercise it we need enough confidence in the system. It is OK if we just made 10%, invested it back into the market and the next month lost 10% – we are just 1% less than we were 2 months back. But what about a possibility of losing 20% or 30% the next month? Heck, without proper risk management, losing 50% or 80% the next month is just as easy! Ultimately, the appeal of a trading method should be judged not as the extreme returns it promises the next month but as the consistency of these returns over the next 10 years and more. Of course, the issue for starting traders is often a lack of capital. When you start with $1000, 10% a month does not seem to be that big of a deal at all. I would argue that the real issue for starting traders is lack of patience, followed closely by the lack of confidence in their trading method. Here is another example: how much do you think the initial $1000 deposit will grow in 10 years using the basic 10% a month scheme we looked at, reinvesting the profits each month? The result will be an astonishing $92,709,068.82. Improve your edge by as little as 1% additional profit a month and you end up with $274,635,993.25 by the end of the same period. So, the main question is not whether you find a way to make 20% a month instead of 10%. The main question is whether you are going to stick to your system and reinvestment plan after 5 years, when your $1000 has already become a respectable $304,481.64. After you increased your account 300 times starting with $1000, are you going to trust your system to do the same in the next 5 years, now starting with $300K? First of all, we need to realize that right now we are only discussing controlled drawdown – the amount of loss we will accept willingly when the market goes against us. Our ability to control that drawdown is also dependent on the market – we need a valid price in area of our stop loss in order to get out of the market. In situations of major crashes such control is not always achievable, as you are unable to exit the market at a desired price. Different risk control measures need to be used there, to be discussed in separate article. Assuming normal market conditions when we can exit with our loss at a predefined price, let’s discuss how we increase the appeal of our trading method. Any profit outcome is only relevant relative to the amount of risk we exposed ourselves on the market. Let’s differentiate between the loss we experienced and the risk we were exposed to. It is possible to finish the month in 10% profit with the highest draw down being 2%. That amount of draw down was our loss that we experienced in the course of making our 10%. However, it is not the risk we were exposed to. To me, the definition of the risk starts with the amount of money we could have possibly lost if all our trades would have closed in a loss – the worst case scenario, very rare, but possible. However, I would complete that definition by adding that the risk exposure is not only limited to the trades we actually took during the month but any trades we might have taken as well. Let me explain what I mean by that. First, the drawdown that we experienced is simply the amount of money we were down during the month. We opened 20 trades and at some point a series of trades resulted in 2% consecutive draw down. It might have happened at any time during the month. We still closed the month with 10% profit. The actual risk exposure during that month is defined as the amount of loss we would experience if all the trades would have failed. If we risked 1% a trade, our actual risk exposure was 20% – that is the amount we would have lost with same 20 trades failing one after another. Unless, of course, our system is limiting the potential of our risk exposure. The potential risk exposure is defined as the amount of money we would have lost on all the trades we could have entered, limited by our system rules. What I mean by this is that our trading system may strictly forbid any trading past a certain loss threshold. In our example throughout this article the potential risk exposure was strictly limited at 10%, because all the trading stops, if such a loss is reached in any given month. Of course, it is still up to the trader to honor such limitation, but that is a matter of trading psychology and not system Money and Risk Management. Coming back to the example, there is another extremely important limitation we established in our trading system. Not only we limited the potential risk exposure at 10% a month, but we also limited the risk exposure during any given day at 0,5%, ensuring that we arrive at 10% loss only by consistently losing day in, day out. Let’s see why it is so important. Imagine another system where potential monthly loss is also limited at 10%, but there is no such daily limit. The trader is using the system successfully, confident that he is well protected against any market surprises and will survive through the bad times. Let’s say on a certain day the trades sees a great opportunity to buy USD against other currencies. He then opens EURUSD sell trade and GBPUSD trade with 0.5% risk each – very conservative approach. The next day he sees that the market retraced against him and stopped out the trades, but fails to go any further, therefore confirming his bias that the USD bears are very weak. This time even better entries are available on USDCAD, USDCHF and USDJPY, along with the same EURUSD and GBPUSD. Excited, he buys first 3 pairs and sells EUR and GBP again. Alas, the market is still trading sideways and his stops are narrowly hit. Frustrated, our trader starts looking for explanation with further analysis and sees that the market was just reaching a round number. Now that the level of support was hit, he is even more confident in the reversal, because his original signals stays the same – buy USD against other currencies. Looking at his loss of 3.5% with quiet disgust, he decides to make the money back fast, with a near profit target and puts 1% risk into the same 7 pairs. Predictable as markets are in such situation, his stops are taken before the price finally moves in his direction. The trader, however, already hit his 10% limit and even exceeded it by 0.5%. Did I mentioned that all of this happened in the first 5 days of the month? Because he didn’t limit his daily loss limit, he was susceptible to trading on emotions as well as overtrading. When the market was not presenting easy opportunities he managed to reach his loss limit in just a couple days and could not do anything for the reminder of the month. Because there is no daily limit, the trading can become very poorly diversified – the trader risked 0.5% in a couple USD pairs, knowing that when they move they usually do so together in the same direction. The trader is extremely frustrated with his performance and now the question is whether he will be able to honor his monthly limit or not – in his current mental state, when he already made a series of bad mistakes, he is risking to break other rules as well. Now we can compare it to our original method, where the risk is not only limited to 10% a month but also to 0.5% a day. When the market is difficult to trade the trader will have to choose the best trading opportunities or spread his 0.5% risk in a couple trades. In other words, such limit ensures diversification, since when the signal is presenting itself in multiple related pairs at the same time, the chances are that the trades in these pairs will close in a loss or a profit together. If the trader has bad attitude today and is susceptible to making errors, he will be forced to stay out of market very quickly, losing no more than 0.5%. By the next day he has enough time to cool down and trade with proper attitude. Even the worst market conditions do not last very long and by giving himself freedom to lose money every single day and still be able to continue trading the next day, the trader is maximizing his opportunities. Because each day presents a new trading opportunity, the trader is truly distributing the signals provided by his edge in a wide array of market situations, ensuring that no single event can affect his bottom line greatly. The trader is better protected against force-major situations, since his risk exposure on the market is always limited. Even if the market trades through his stop loss, the damage will not be as devastating. Besides protecting the account from being wiped up by a couple erroneous errors, such trading limitations are even more important psychologically. 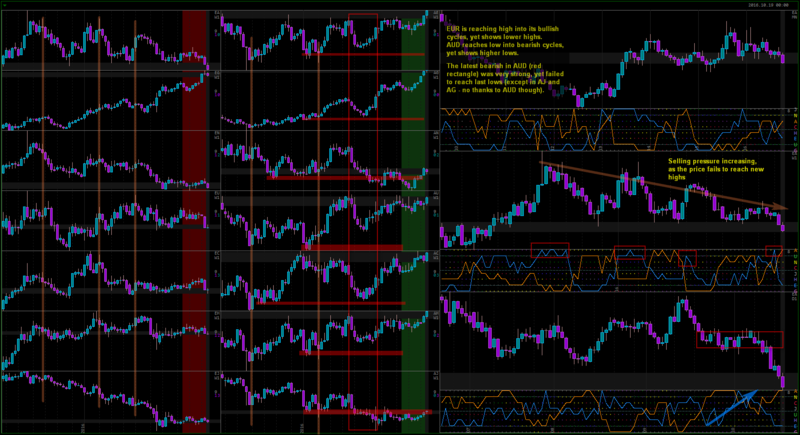 When this risk management system is setup, the trader can work with more confidenc. The system allows him to know clearly what will happen not only if this trade loses, but also if every trade will lose until the end of the month. The trader can concentrate on finding his edges and acting on them. Each day he knows his limits, and he also knows that no matter what happens, he can continue trading for the whole month, looking at new opportunities each day, without the fear of hitting his loss limit. In later issues we will be discussing different variations of managing the risk of trading. We will also look at profit expectations that we can realistically have when such risk limits are used.